Olive Kitteridge is an unsentimental curmudgeon (think of the cartoon character “Maxine”) who will steal your heart. For all her glaring faults, her deep compassion and humanity forced me to fall in love with her. Like the rest of us, she’s a bundle of contradictory impulses. She can be heroic and self-sacrificing, childish and selfish. This prickly, brutally honest woman is simply unforgettable. As is the case with most literary fiction, “Olive Kitteridge” is more about people than plot. The novel is actually a collection of 13 short stories in which Olive is sometimes the main character and sometimes in the background as the reader gets to know the other residents of Olive’s small coastal hometown of Crosby, Maine. You will meet Olive’s former student on the verge of suicide, a piano player whose lover has dumped her, an anorexic teenager, an elderly mother whose son has been imprisoned for a shocking crime. Throughout the book, Strout creates cameos of ordinary people living ordinary lives, at least on the surface, but as she shines her light on these faces, we see how extraordinary they really are. Through the years as Olive interacts with her family and neighbors, she grows and changes. When the story begins, she’s a seventh-grade math teacher; when the story ends, she’s an elderly woman who has grown to understand some deep truths about herself and the human condition—what is important and what is not, the meaning of family and love, the joys and harsh realities of life. The novel is exquisitely crafted. The beauty and grace of Strout’s prose is something to be savored and enjoyed. 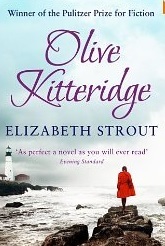 Reading “Olive Kitteridge” is like watching an Olympic ice skater glide and twirl effortlessly across the ice. No wonder this novel won the Pulitzer Prize for fiction in 2009. Sounds fascinating Michal Ann! We all have gifts and imperfections. Thanks for your beautifully crafted review and recommendations. Wow! Want to read this ASAP!